Jane Gilmore completed her TEDxSydney talk on media violence against women, with a call to citizenship: “Because if journalists won’t fix it,” she said, “you can”. A journalist herself, Gilmore started the FixedIt movement to help us do exactly that: call BS when the media incorrectly reports on crimes against women. Rather than focusing on the often lengthy articles themselves, Fixedit hails the dodgy headlines that tend to protect the perpetrators and blame the victims. While the simple, yet high impact, visual sees Gilmore putting a red line through the headline and then rewriting it correctly. “Here you go,” she drily says to the media outlet. “I #FixedIt for you”. 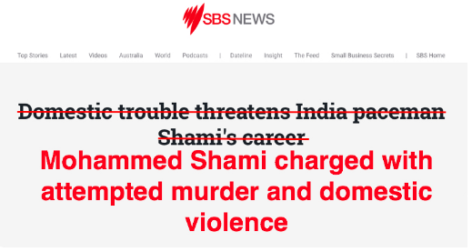 See how the headline suggests a mere family argument put Mohammed Shami’s career in jeopardy, when the truth is he was charged with attempted murder and domestic violence. Saving a man’s career at all costs, is a cornerstone of patriarchal culture, so here the editor and/or writer, be it consciously or unconsciously, muddies the water on who did the actual abusing and who was the victim. “I’ve had these headlines change within an hour of me posting on Facebook and Twitter,” Gilmore said. Around since 2014, social media is FixedIt’s power base with women leading the charge. Followers act quickly complaining directly to the media outlet, sourcing journalists and editors contact information, then posting the details to help others do the same. You might think this is mainly a tabloid problem, but the ABC and The Guardian, as well as SBS, appear on the FixedIt feed, explained Gilmore on a recent Monash panel. One thing’s for sure, the constancy is evidence of the media’s role in reinforcing gender biases and perpetuating violence against women. What media academic Margaret Simons, who headed the panel, describes as an, “all-pervasive problem.…and one of our biggest human rights stories”. The numbers don’t lie: “1 in 4 women have experienced physical or sexual violence by an intimate partner, and currently one woman per week is killed by a current or former partner,” making accurate reportage imperative to awareness and prevention. I don’t know about you, but I’m starting to feel pretty hot under the collar. A good thing confirms Gilmore. Thought starter: Is Your Message Getting Lost in Translation? Thought Starter: Can Blockchain Secure More Democratic Elections?